I have to admit that although I saw the classic film An American in Paris, starring Gene Kelly, when I was a small child, what I most remember about it is being somewhat confused and bored by the iconic dance sequence that ends the movie. I guess I was too young to appreciate it. Now, the tour of the stage version with the classic Gershwin score and a revised book is on stage at the Fox, and viewing the story and its dazzling dance sequences as an adult, I’m anything but bored and confused. Although the story has been modified somewhat from the film, this production is visually stunning, emotionally stirring and musically sensational. The setting, as the title suggests, is Paris. The time is just after the end of World War II. Jerry Mulligan (Garen Scribner) is a young US Army vet and aspiring painter who finds himself intrigued with the City of Light and with a mysterious young woman that he meets but whose name he doesn’t learn at first. He decides to stay in Paris and wanders into a cafe where he meets fellow American veteran Adam Hochberg (Etai Benson), who plays the piano and writes music, hoping to become a successful composer. He also meets Henri Baurel (Nick Spangler), the son of wealthy French manufacturers, who harbors the secret dream of becoming a song-and-dance man in America. Eventually, they cross paths with Jerry’s mystery woman, the gifted young ballerina Lise Dassin (Sara Esty), whose mother had been a famous dancer. Lise herself has a secret that ties her to Henri, although both Jerry and Adam find themselves drawn to her and she herself feels drawn to Jerry. There’s also wealthy heiress and arts patron Milo Davenport (Emily Ferranti), who forms an attachment to Jerry as well. All the complicated love polygons are only part of the plot, as the ghosts of the past and the spirit of the future battle within the various characters who strive to make something of their lives, and the world, after the war. It’s a well-constructed plot that revises and fleshes out some of the stories from the film, adding extra Gershwin songs in a celebration of life, art, and ultimately hope. This is such a dance-heavy show that I have to mention that director/choreographer Christopher Wheeldon’s wonderful, lyrical work here. The strong influences of ballet, jazz, and occasionally tap are here in evidence, expertly, energetically, and emotionally danced by the top-notch ensemble and perfectly cast leads. The cast is ably led by Scribner as the outgoing, charming Jerry and Esty as the somewhat mysterious, conflicted Lise. Their chemistry is outstanding, and their dancing is simply wondrous, especially in the dazzling “An American in Paris” ballet near the end of the show. There are also strong performances from Benson as the sweetly snarky Adam and Ferranti in a witty, sympathetic performance as Milo. Spangler as Henri is also excellent, making the most of a spectacular showcase production number in “I’ll Build a Stairway to Paradise”. The whole cast here is incredibly strong, showing of incredible dancing skills on such Gershwin classics as “I Got Rhythm”, “S’Wonderful”, and more. Technically, this show is just plain beautiful. Bob Crowley’s glorious set design is remarkable in its simplicity and its elegance, relying largely on movable set pieces that flow onstage as if they are part of the dance, augmented by truly stunning projections by 59 Productions. Crowley also designed the gorgeous, stylish costumes that add much to the 1940’s air of the production. There’s also spectacular, atmospheric lighting by Natasha Katz that enhances every scene and production number. This is such a wonderful show. It’s poetic, balletic, and dramatic with just the right amount of humor to move the story along. The characters are well portrayed and their stories are convincing, but what is mostly evident about this production is its celebration of life, art, and music in a visual, auditory, and emotional sense. It’s a screen-to-stage adaptation that honors its source material and manages to expand it in a richly compelling way, and it fills the Fox stage superbly. It’s definitely a show not to be missed. Now, I need to see the movie again. The North American tour of An American In Paris runs at the Fox Theatre until January 29, 2017. The Muny hasn’t hosted a national touring production for a very long time. 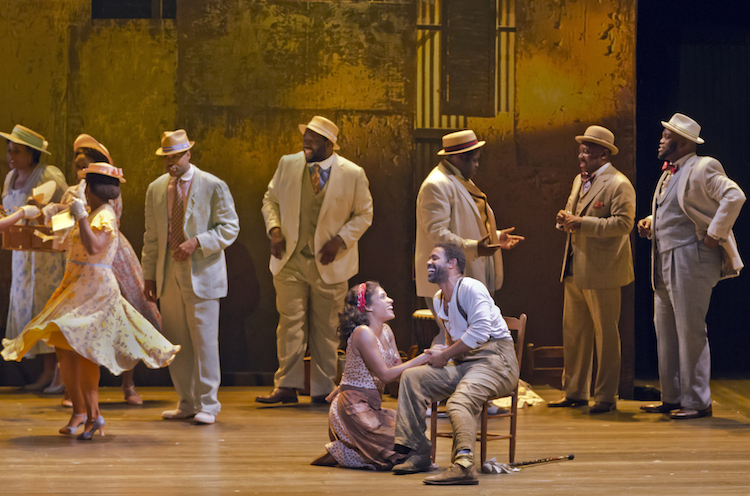 While Executive Producer Mike Isaacson, in his notes in this week’s program, promises that this won’t become a regular occurrence, he couldn’t pass up the chance to present this particular production, the national tour of The Gershwins’ Porgy and Bess, in the Muny setting. Although I do think the production suffers a little bit in that it’s obvious that it wasn’t designed to fit in this unique and gigantic performance space, for the most part I would say it’s a memorable performance with a very strong cast that does justice to the show’s memorable score. This version of the show is an update of the classic Gershwin opera. Director Diane Paulus worked with playwright Suzan-Lori Parks to adapt the story into more of a modern musical theatre format, with more spoken dialogue and a streamlined plot. Although it was a source of much controversy before it opened on Broadway, it eventually garnered multiple awards and nominations It tells the story of the residents of Catfish Row, a poverty-stricken African-American fishing community in Charleston, SC. After an atmospheric opening featuring the classic song “Summertime”, the story focuses primarily on the conflicted Bess (Alicia Hall Moran), a drug-addicted young woman in a volatile relationship with the burly, violent dock worker Crown (Alvin Crawford). Bess is looked down on by the people of Catfish Row until she forms a bond with the gentle-hearted Porgy (Nathaniel Stampley), a disabled beggar who has previously admired Bess from afar and who seems to be the first person in Bess’s life who treats her with dignity.. Meanwhile, the smooth-talking drug dealer Sporting Life (Kingsley Leggs) tempts Bess with “happy dust” and offers of a more extravagant life in New York. After violence breaks out at a crap came, Crown flees from the law and Bess tries to start a new life with Porgy and seeks the acceptance of the others in the community, only to be continually haunted by her past and by situations that threaten the the well-being of Bess, Porgy and those around them. This production serves as something of a window to another era in American history, trying to bring the more stylized elements of the opera into more of a realistic presentation and showing the struggles and the hopes of its characters. The close-knit community has its leaders and its outcasts, and the overall picture of life in an African-American community in the segregated South in the midst of the Depression is portrayed with detail in the characterizations on more of a stylized set. I haven’t seen the full-length opera so I can’t compare directly, although this production does retain some of the operatic scope, particularly in the sweeping musical arrangements played with vigor and emotional depth by the wonderful Muny orchestra conducted by Dale Rieling. The costumes by Esosa are richly detailed and add to the overall period atmosphere. The set, designed by Riccardo Hernandez is more abstract, with a simple framework of painted flats surrounding a wooden platform where most of the show’s action takes place. Designed for the national tour, this set is the closest thing this production has to a real problem, since it is simply dwarfed by the enormous Muny stage and often gives the show a confined, boxed-in and occasionally detached quality, like the audience is watching the show on an oversized TV. This quality improves a little bit in the picnic scenes that take place on a nearby island, in which the back wall of the “frame” is removed and the Muny’s scenery wall is shown displaying a backdrop of clouds, framed by the real trees the frame the stage and provide more of a sense of openness. Still, even with that one minor drawback, the overall production is a remarkable success. The singing is simply glorious, with a strong ensemble and outstanding performances from the leading performers. As the determined Porgy, Stampley is the emotional anchor of this production, with a soaring voice and a strong stage presence. He projects a palpable sense of decency and quiet strength, with that ever-present love for Bess that defines his character. Stampley and Moran’s scenes together are among the highlights of the show, such as the intensely emotional “Bess, You Is My Woman Now” and “I Loves You, Porgy”. Stampley also displays warmth and energy in his well-known song “I Got Plenty of Nothing”. 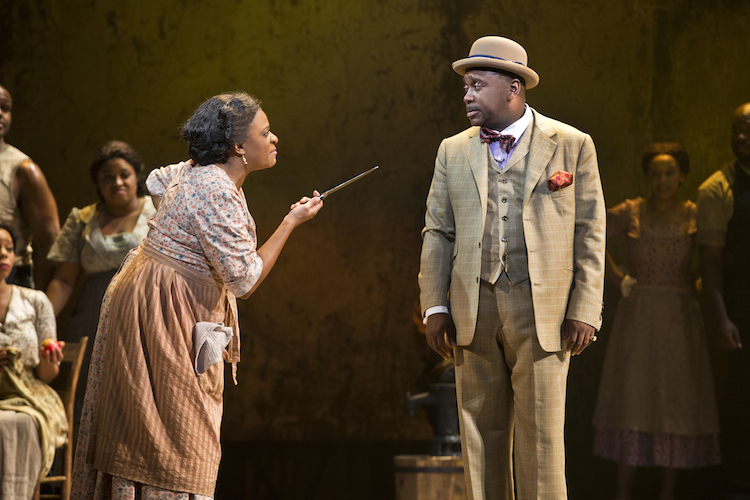 Moran is a memorable Bess, as well, with a strong voice and complex characterization. The other real standout in this production is Leggs as the slick, cynical Sporting Life. His rendition of the comic ode to skepticism “It Ain’t Necessarily So” early in the second act is a showstopper, and he’s also at his wheedling, smarmy best in “There’s a Boat That’s Leaving Soon” later in the show. There are also excellent performances by Denisha Bellew as the grieving widow and local faith healer Serena, Crawford as the suitably menacing Crown, and by Danielle Lee Greaves as the good-hearted and strong-willed community matriarch Mariah. It’s a very strong cast with too many great voices and performances to mention, with some memorable production numbers and strong dancing, as well. It’s a memorable performance of a classic show that’s brought more into an accessible scale, with its many familiar songs resonating throughout the Muny performance space with vibrancy and honesty. Overall, I’m very glad that the Muny chose to bring this production to its stage, even despite the obvious fact that it’s not properly scaled for the size of the colossal stage. I think that sense of confinement would be an issue with any production that is not specifically designed for the Muny, though. Still, for the most part I would call this production a resounding success. I still have the melodies of the wonderful score playing in my head as I write this review. It’s a vibrant update of a well-known work, with a lot to think about and many strong performances to remember.